Brig. 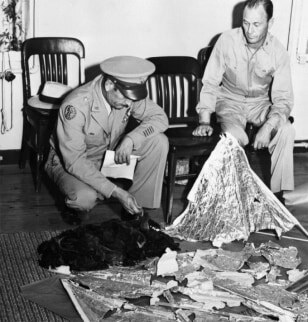 Gen. Roger M. Ramey, commanding general of 8th Air Force, and Col. Thomas J. Dubose, 8th Air Force chief of staff, identify metallic fragments found by a farmer near Roswell, N.M., as pieces of a weather balloon. This is the basis of the Roswell Incident, the supposed crash of an alien spacecraft.